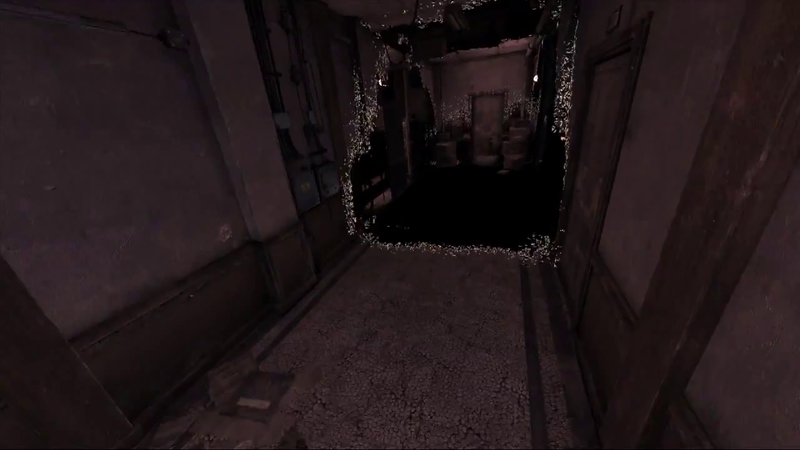 TGS has come and brought me a treat: another Silent Hill: Downpour trailer to dissect into tiny little pieces in hopes of deciphering some of the mystery. The TGS trailer brings a look at some familiar locations from the last two trailers and demonstrations, but it has also brings a look at quite a few new scenes. My previous analysis was on the E3 2011 trailer; check it out. I’m certainly getting my hopes up on Downpour. With every new trailer and detail, my anticipation grows. Picking apart these trailers is nothing compared to what many fans and myself will be doing come the time of release. Don’t expect to see any of your Silent Hill fanatic friends for a couple of weeks; they’ll be huddled in a dark room with a notebook and magnifying glass. “Revenge is a long, treacherous road isn’t it, Mr. Pendleton? Where do you suppose it ends?” says a mysterious woman to Murphy (00:08). The only other woman than Anne that we have seen is the nun. Her role seems very nefarious. She can be seen at 3:10. She’s holding her hands up in a spiritual manner; perhaps she is controlling the Gas Mask Monster. At 01:26, her expression looks very condescending. Is she ultimately out to help Murphy? I don’t think so. She seems to have her own agenda. How she has control over a creature, –if it is a creature–I’m not sure. The little boy didn’t seem phased at all by the hulking figure approaching him (01:28). This leads me to believe that the boy is not real. He is not a real boy trapped in the town, but rather a manifestation or illusion–nothing surprising. His clothes further suggest this. They look akin to something from the early 1900s. So does the the furniture, and cars seen in some scenes. Perhaps this attack symbolizes the boy being killed by someone he knew and trusted. The child did not cower, or even acknowledge the presence of GM. Murphy could only sit back and watch the terrible event (02:38). 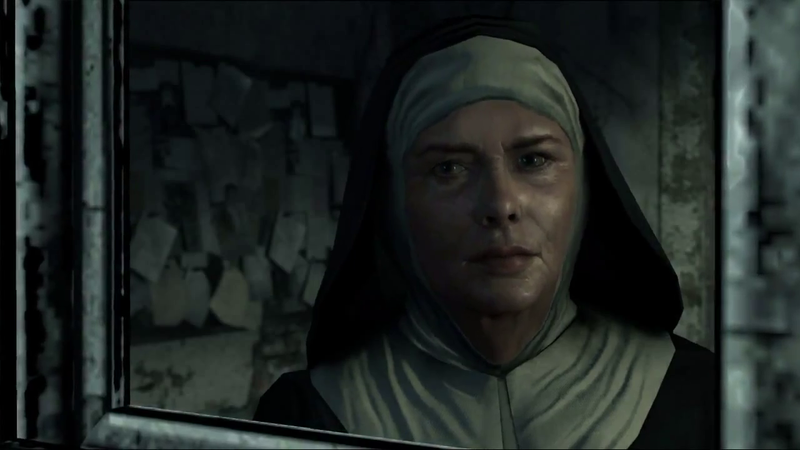 The nun seems in control of GM; at 02:52, she can be seen just a few feet away from the hulking creature. If she was afraid, she would distance her self. She further fulfills my assumption that she controls GM at 03:10. Her arms are up in praise, or chanting rather than in fear. How she controls GM is something that has left me to a few possibilities. The Nun may have control over a manifestation of her own. How? Perhaps she is a follower of the same beliefs of The Order, the cult most prominent in Silent Hill 1 and 3. She may even be using these powers to control an aspect of Murphy’s delusions. GM may belong to Murphy, and she has power over that. What is she doing in the fog world? I’m not entirely sure. I would also like to point to 02:38. Orphanage, Chapel and the Main Hall are listed as locations in the building that Murphy, GM, the boy, and possibly the nun reside. Seeing an orphanage listed makes me think of Wish House. 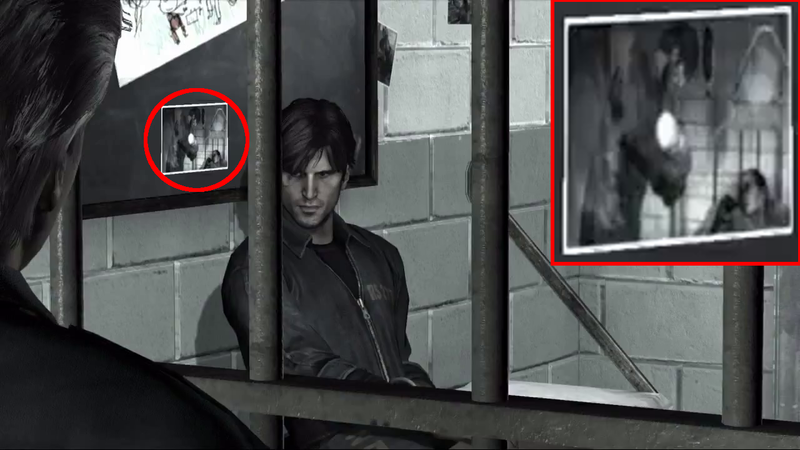 The cult controlled orphanage Wish House was explored in Silent Hill 4, but maybe not all of it. 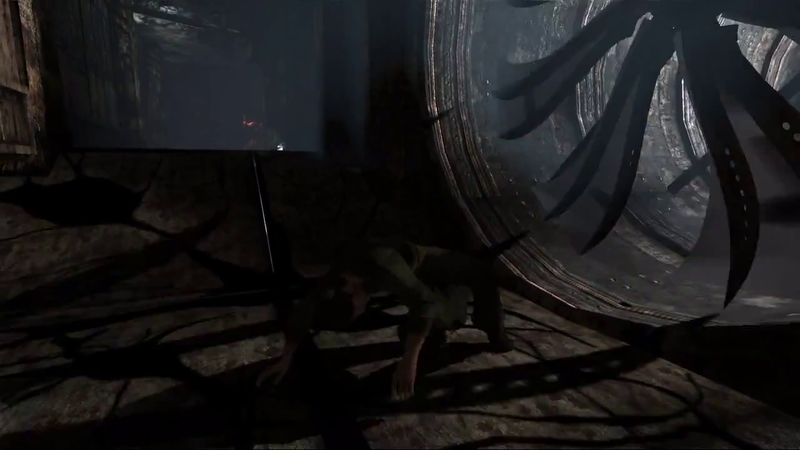 I kind of doubt Murphy will end up there due to his exploration of a new part of Silent Hill, but it would be pretty cool to revisit the location, but in a different part. My mind can not decipher what I’m looking at (00:38). What’s wrong with his body?! Let’s call this weird pink wheelchair guy Pinky. Pinky can be seen at both 00:38, and 01:00. 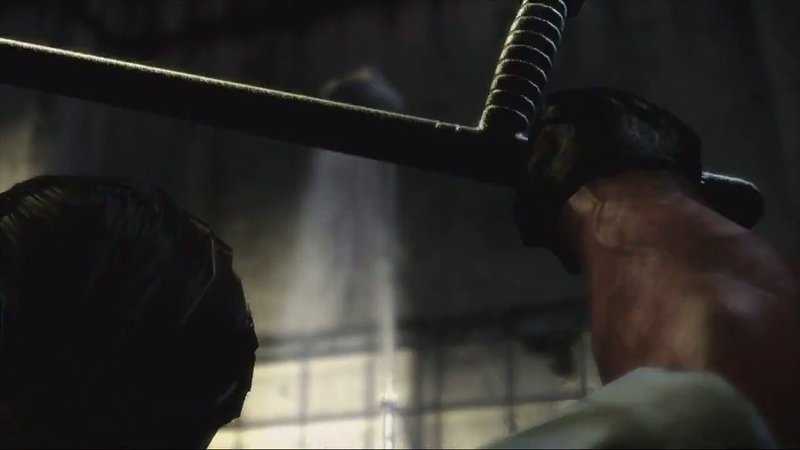 He was shown before during some E3 demonstrations, and I think it’s safe to say he will continue to have Tyler Durden-like appearances throughout the game. His mangled body does something akin to the old Silent Hill games: his features are so distorted and indecipherable that it’s hard to put features together in the mind. Looking at Pinky’s face, it appears that he has a light source emanating from his left eye. Perhaps a monocle reflecting light from the hallway. This immediately brings to mind the odd talking creature from the Gamestop Canada leaked video. 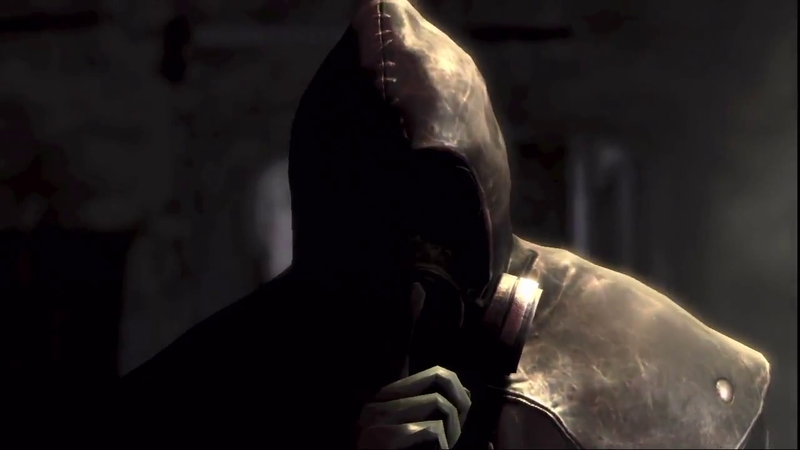 Will Pinky be the main antagonist of Downpour? It seems like a possibility. If he is from Murphy’s past, why is the nun –who is another human in the town–also against Murphy? A manifestation and a real being working against Murphy at the same time? In the two combined images (03:07/3:08), we can see an assault by three Screamers. They have found their way to DJ Ricks’ studio at WLMN FM. Ricks probably doesn’t survive this encounter. 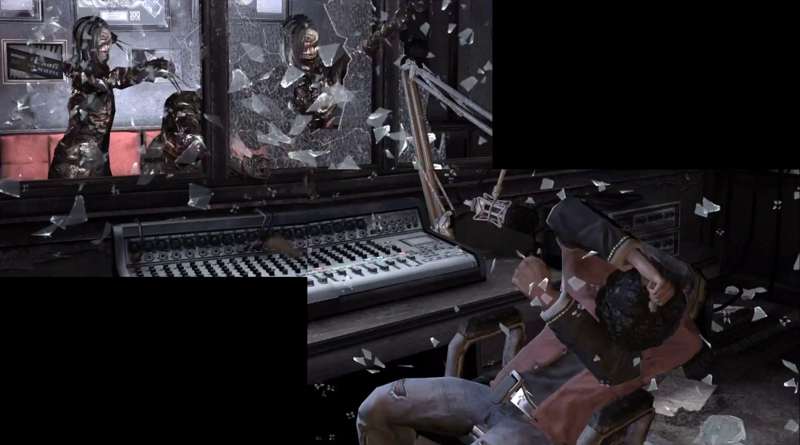 Officer Anne Cunningham also appears to be in the studio at the time of the assault. To me, it plays out like this: Murphy makes his way to WLMN FM, has a talk with DJ Ricks, and then Anne comes in. Soon after, all hell breaks loose, and the Screamers make their way in. 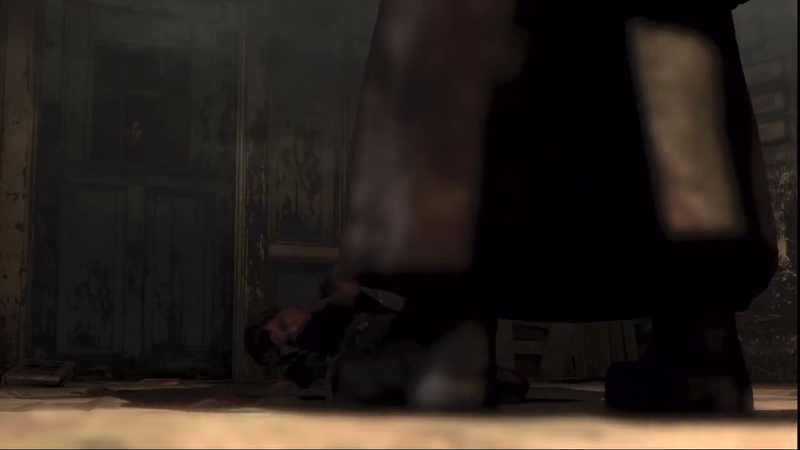 Judging by how the scene at 01:34 looks, I do not think Anne gets killed in a cutscene. This looks like an in-game encounter where Anne simply gets hit by a Screamer. Does this mean that Anne will fight along side Murphy in this scene? At 03:09, a Screamer is seen holding Murphy rather than attacking. The creature has more than capable weapons attached to its arms. The Screamer could issue a fatal blow quite easily. The enemies’ real intentions are to guide the protagonist. Assuming that the Screamer is a manifestation of Murphy, it will not harm him in the cinematic, because he is far from being enlightened by the town; his past has not yet been atoned for. 02:00 gives us a closer look of another enemy. It does not have a name yet, but its appearance is very familiar. It’s hard to tell if this is a single creature and not a type. 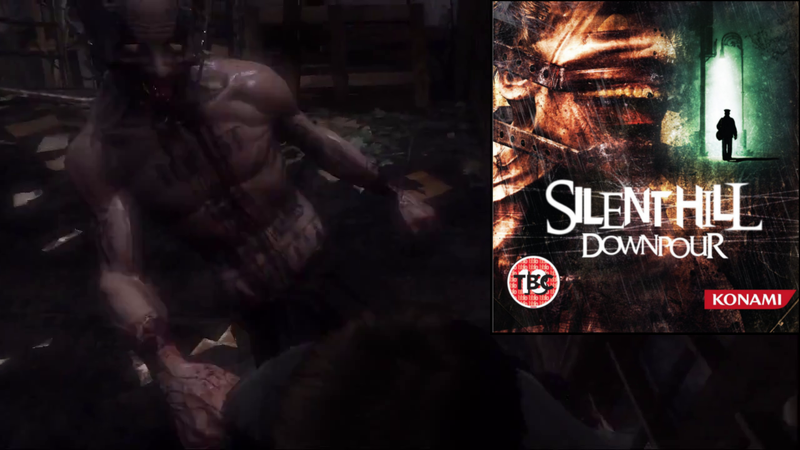 This very same creature can be seen on the Silent Hill: Downpour EU cover. On one half of the combined image (01:33/01:21), Murphy is leaving Ryall State prison. Murphy’s overalls display RS-273A as the his inmate number. 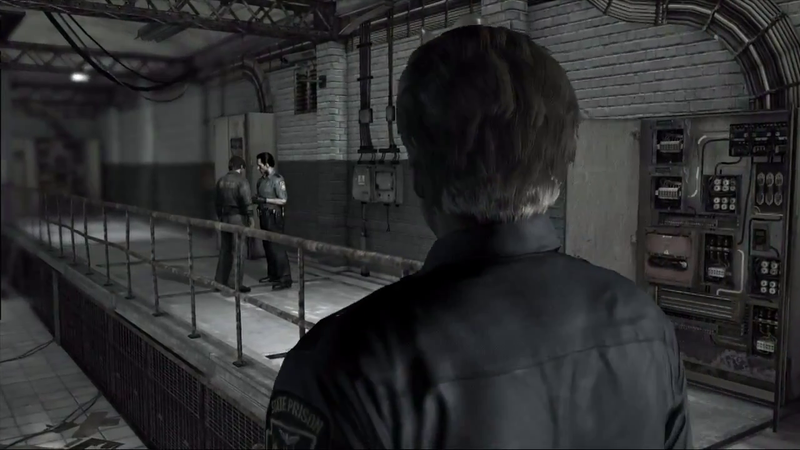 The other half of the image shows Murphy in different prison overalls. These orange ones have a new inmate number, and are from a different prison. What prison does O.P. stand for? That seems to be a question only answerable when the game releases. It could be a sudden change in clothes due to a shift to the Otherworld. 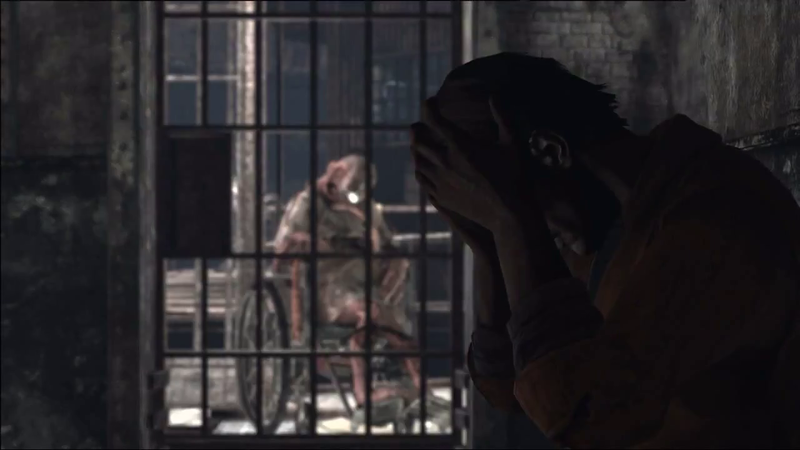 Perhaps the code is for the prison Murphy was being sent to before Silent Hill interrupted the transfer. 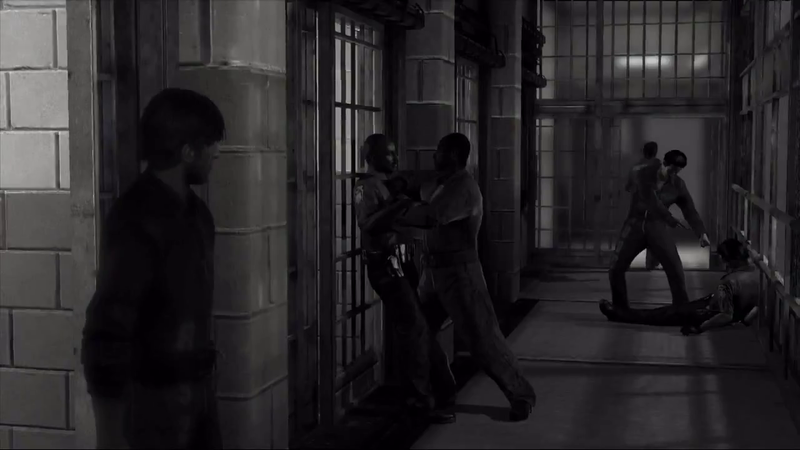 Thanks to commenter Alice for reminding me of Overlook Penitentiary from Silent Hill: Homecoming! I completely forgot about that prison. OK, now we know that Murphy will end up in Overlook Penitentiary. Silent Hill: Homecoming put Overlook in Central Silent Hill, which didn’t quite work with the previous map layout in the older games. 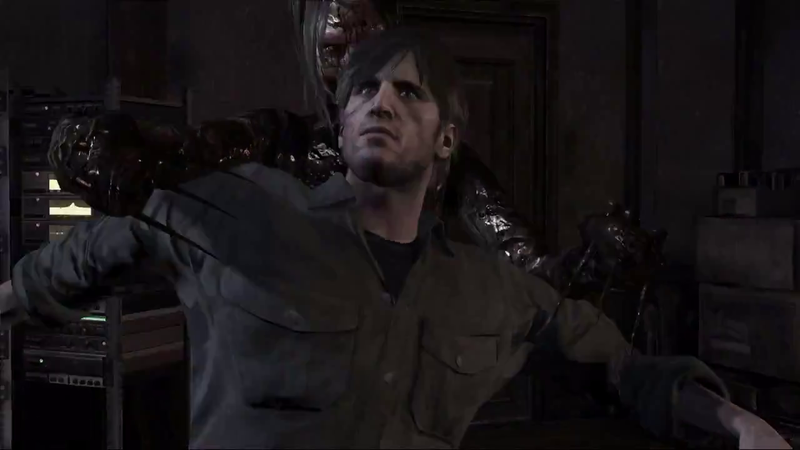 Silent Hill: Downpour takes place in a South Eastern portion of the town. 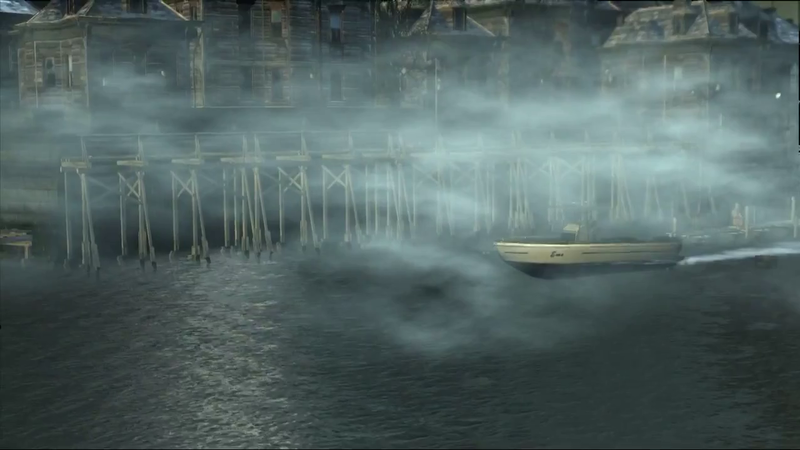 Murphy either makes his way to Overlook, or gets sent there during an Otherworld transition. My bets are on the latter. 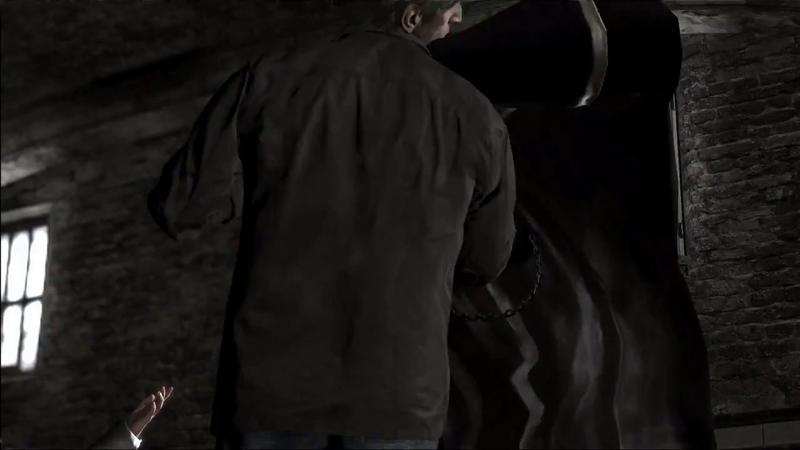 We also get to find out if Overlook was intended to be in Central Silent Hill. Homecoming caused some confusion with the canon map layout, and I wouldn’t be surprised if the new team aimed to fix those problems. The scene that shows Murphy in his Ryall state cell has pictures on the walls (01:35). There appears to be a child’s drawing, and a photograph of Murphy holding a baby, while standing in front of a woman laying in a bed. Murphy appears to have a family. Whether they are still alive remains to be seen. The guard standing in front of Murphy’s cell has gray hair that is slicked back (01:35). He can also be seen at 01:44. 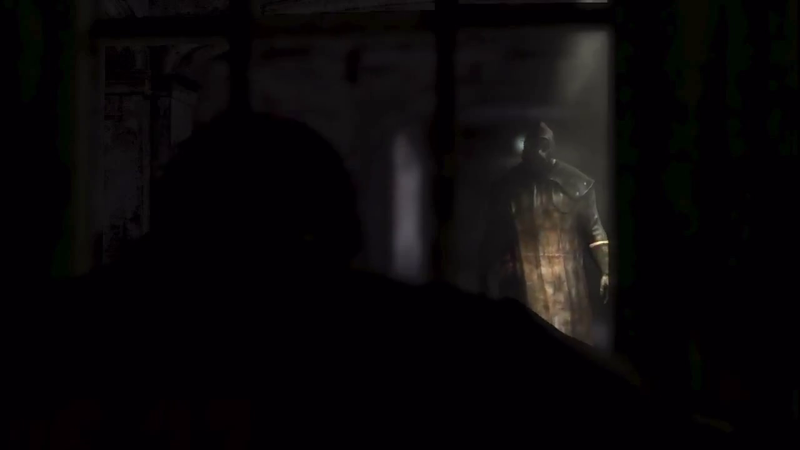 The other guard, who was also shown in the E3 2011 trailer, can be seen in the distance talking to Murphy. I don’t think he likes Murphy very much. Well, maybe he does, but in an abusive way. A glimpse at a prison shower beating can be seen at 01:39. 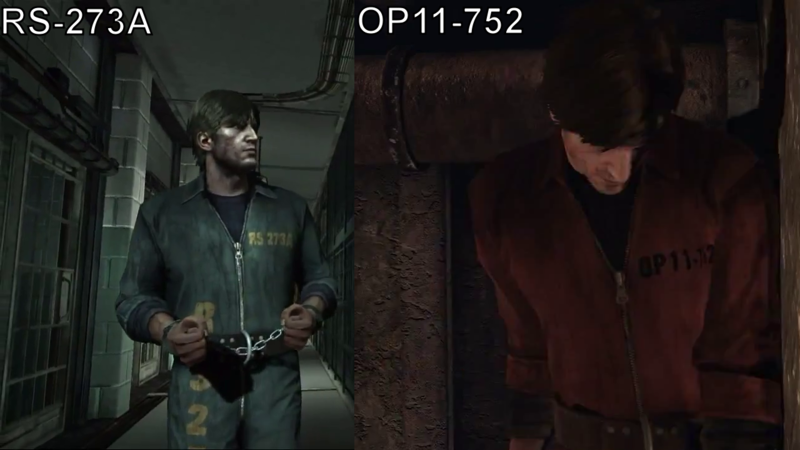 I really think the guard from the E3 2011 trailer, and 01:44 has a thing for Murphy. At 02:10 that very same guard can be seen with a gun to his head by a prisoner. A prison riot appears to be the very thing that started the transfer in the first place. 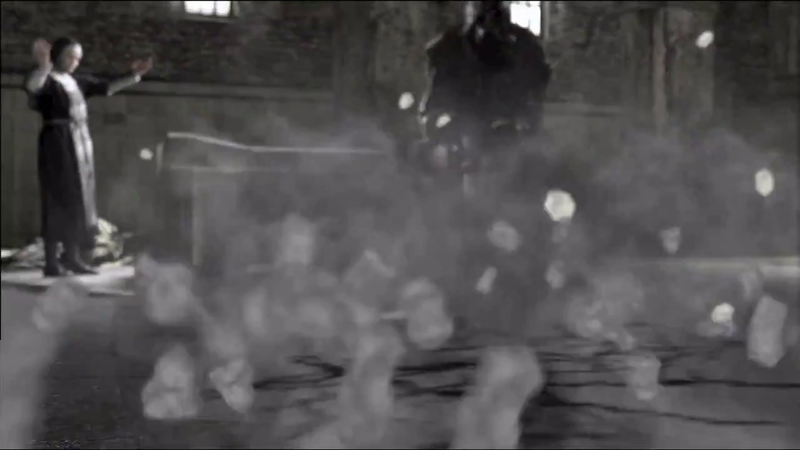 The riot scene is in black and white; this may indicate that it is a flashback of sorts. The Hispanic prisoner seen during the riot has been in all three trailers; I think his role may change based on decisions in the game, but he is certainly a reoccurring character. That’s a pretty waterside setup (00:28). What part of town is this? 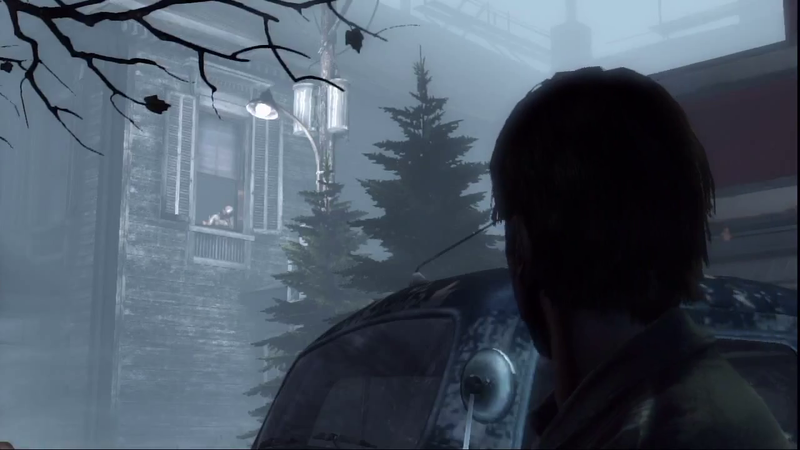 Silent Hill: Downpour takes place in a new part of town, so it’s not all too strange to see a different layout for these waterside structures. This area seems a bit older; colonial even. It’s also safe to say that Murphy is voyaging across a section of Toluca Lake. Environmental hazards; that’s sorta new (03:14). Murphy might have walked into a hazardous area, and we are given a glimpse right before he dies. This scene doesn’t really look like a cinematic that will leave Murphy unharmed; I doubt it’s supposed to happen as part of natural level progression. This is perhaps the fastest Otherworld transition in the series (03:16). Look at the speed of that thing. Murphy must really be in the middle of an intense scene for the shift to spread so quickly without the apparent presence of water. One could say that the shift moves like water. Hmm. 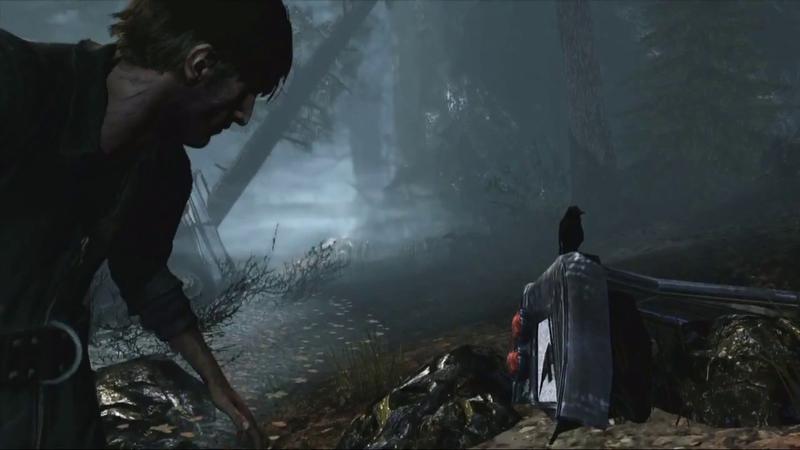 Like I said in my E3 2011 trailer analysis, ravens play an important part in Downpour and Native American culture (02:20). It looks like Murphy just woke up from the bus crash, and already is being watched by a raven. I wouldn’t be surprised if they were seen throughout the town during gameplay. Maybe there will even be a bonus for finding them all. 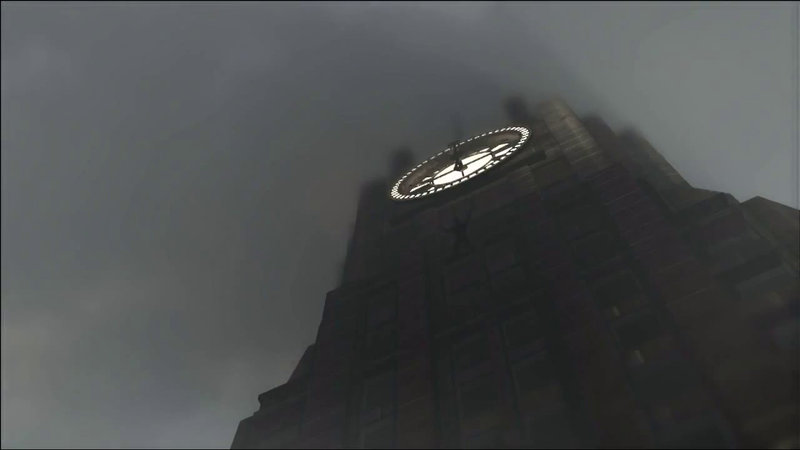 At 02:12, Murphy has finally reached the clocktower. I originally thought it was the church, but looking at the size and design, it’s clearly not. The clocktower looks like a large building: there are multiple floors. 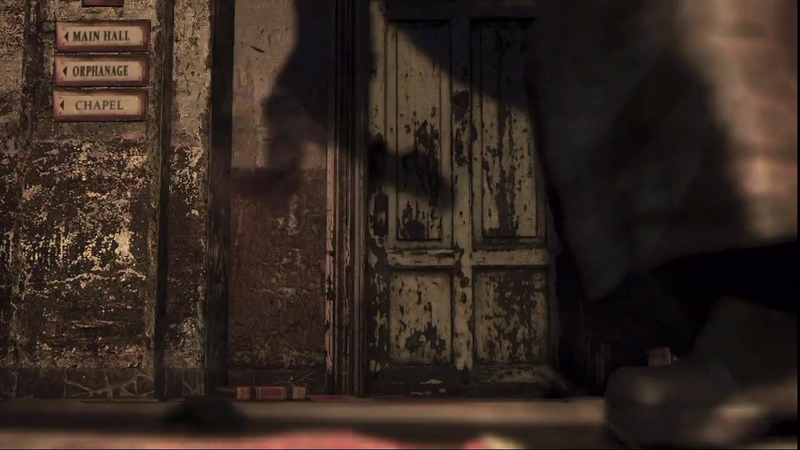 Could this be the orphanage? The orphanage has a chapel, but it’s not a church. We’ll have to see if Murphy actually visits a church in Downpour. 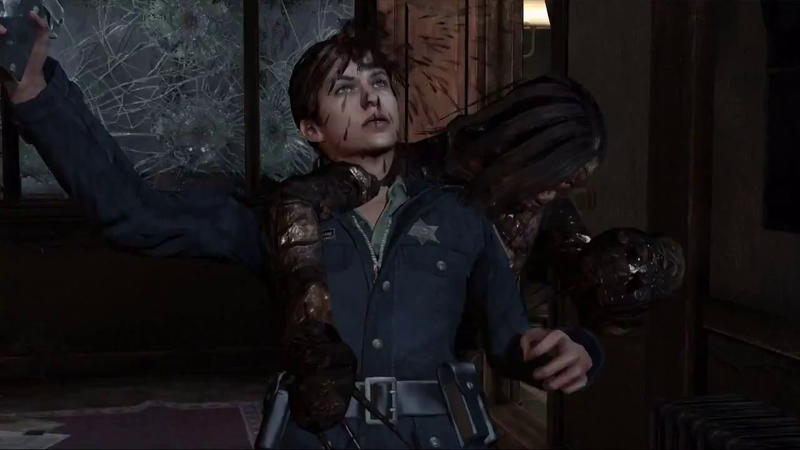 I think Silent Hill: Downpour will be pretty well thought out. There seems to be some complex things that require interpretation in the trailer alone–maybe I’m thinking too hard. I’m looking forward to the full game later this year. I’m having some good feelings about this game. 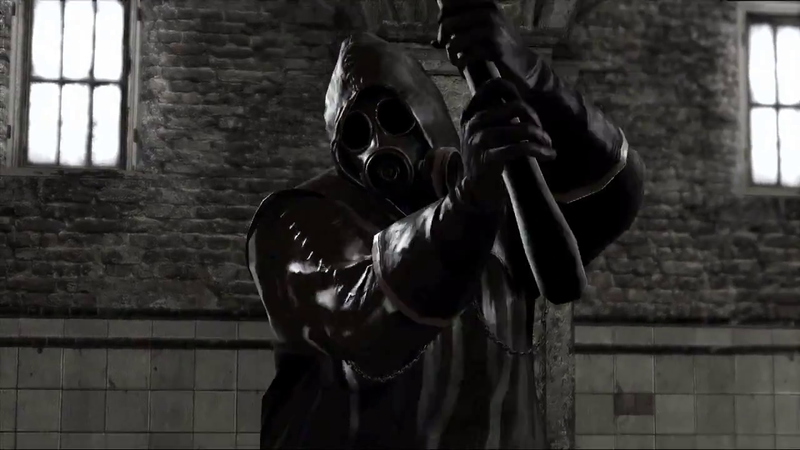 I think Silent Hill: Downpour will be a worthy successor to the original four Silent Hill games. Did I miss anything in my analysis? Let me know in the comments!